In its simplest form, the American Dream asserts that success should be determined by effort, not one’s starting point. This is the promise on which most Americans base their hopes and the calculus that is supposed to govern our institutions. Specifically, in the modern US economy, the path to prosperity is understood to pass through the education system. Americans believe—and children are told—that individuals should have an equitable chance to climb the economic ladder, through exertion of their innate talents. However, while there are few ways for children to exit poverty without educational attainment, there is mounting evidence that education is far from a guaranteed ticket to opportunity. There is a more than 30% gap in college graduation rates by family income. Even more discouraging, these gaps persist even among students with strong academic preparation; 74% of such students from high socioeconomic status graduate college, compared to only 41% of students with similar academic prowess but more economic disadvantage. Further, high school students from low-income families who manage to enroll in college often find themselves in the lower tiers of the stratified higher education system, where they realize outcomes that lag wealthier peers’. Even when low-income students push through layers of disadvantage to graduate from elite universities, they usually do so saddled with debt. For these students, higher education comes at a high price—one that may take them years to pay off. As their incomes are diverted from asset building to debt management, they lag behind their peers, even with comparable levels of educational attainment. These gaps are often dramatic and—multiplied throughout this generation—they directly undermine the idea that educational attainment is an equalizer in American society. Quite shockingly, low-income students do not get the same benefit from their college degrees as those who start out at an advantage. Instead, college graduates from poor families earn 91% more over their careers than high school graduates from the same income group; but, college graduates from wealthy families earn 162% more than those with just a high school diploma. Race, another dividing line in the distribution of American wealth, also influences return on degree. Black families whose head earned a college degree have 33% less wealth than white families headed by a high school dropout. Particularly alarmingly, the nation appears to be moving in the wrong direction on these fronts, even as media headlines, student activists, and indebted parents increasingly decry the uncertainty of the education path to prosperity. Indeed, as college grows increasingly expensive and costs shift to students and parents, wealth matters more than ever for determining who can leverage education for future payoff. While salvaging the American Dream may not require closing the wealth gap entirely, ensuring that education can be a ladder of equitable opportunity requires reducing wealth disparities that start at birth. This is perhaps the most critical conclusion policymakers are forced to grapple with, if the United States is to restore education as a meaningful and viable path to prosperity. While reforms—those that innovate new instructional delivery, tinker with credentialing, or soften the blow of student indebtedness—may speak to some angst about college costs and value, only by striking at wealth inequality directly can policy restore education as a viable path to the nation’s promised prosperity. In today’s economic context, reducing inequality will require a wealth transfer, large enough in size to equip disadvantaged children with a real stake in their own futures, and specifically formulated—by targeting children and focusing on postsecondary education—to be politically palatable. While salvaging the American Dream may not require closing the wealth gap entirely, ensuring that education can be a ladder of equitable opportunity requires reducing wealth disparities that start at birth. Young children are equipped with the social and emotional competencies that support improved academic achievement. Poverty is less disruptive to children’s development—even without changing families’ current income. Largely by encouraging and sustaining higher expectations of postsecondary education, children chart a clearer trajectory through school, with greater academic achievement and better prospects for college enrollment and graduation. Stronger return on degree, via reduced dependence on student debt and cultivation of healthy financial practices. CSAs have demonstrated tremendous potential to improve children’s lives, equip them for achievement, and close gaps. Though CSAs cannot change all the underlying conditions that challenge children and families, they may disrupt the processes by which these factors affect how well-positioned children are to move successfully through the opportunity pipeline. Assets alter how people see themselves and their futures. However, making the opportunity pipeline equitable requires that all children have the propulsion of wealth, and CSAs, as currently designed, may not be enough to place the American Dream within reach. With wealth playing the determinant role in children’s futures evident in the widening gap between the college prospects of privileged and disadvantaged students, leveling the playing field will require policy that builds on CSA evidence to construct a universal, substantial, and progressive investment in early educational asset holding, as a sort of “down payment” on every child’s American Dream. There can be little doubt that endowing families with assets from which to finance children’s educational attainment makes a difference. Interrupting the distorting effects of wealth inequality on our nation’s primary engine of opportunity—education—is technically an easy fix. It requires only the political will to make our education system’s actual performance match our aspirations for it – as an equalizer in society, a path out of poverty, and a truly fair chance at the American Dream. Featured image credit: Cute piggy by Fabian Blank. CCo via Unsplash. Melinda Lewis, MSW, is Associate Professor of Practice at the School of Social Welfare, University of Kansas, and also Assistant Director at the Center on Assets, Education, and Inclusion (AEDI). 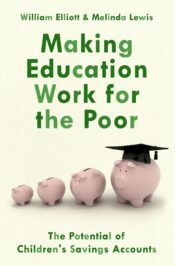 She and William Elliott are the authors of Making Education Work for the Poor: The Potential of Children's Savings Accounts (OUP 2018).